Desert Safari In Dubai is a unique opportunity to experience the extra ordinary beautiful Dubai Desert. It is very pleasant to see the sands in the Desert glowing when it is hit by the Sunshine. Dune Bashing is one of the major attraction when on a Desert Safari. Dune Bashing is also known as sand bashing and Roller coaster drive in the desert. This is the adventurous part of your safari when your car rides and glides up and down the high and low golden sand dunes. Dubai is one of the most promising travel destinations in the world which offers you a variety of Tours , Excursions and Sightseeing Activities. But still as we mentioned before 7Days Holidays leads the table as it enjoys a five star rating among visitors when it comes to match the popularity. 7Days Holidays gives you a chance to experience the unique blend of the Dubai desert. The Dubai Desert is famous for its beauty and history it is also knows as golden sands of Arabia. During your Desert Safari Dubai you experience sand boarding in which we give you a chance to slide on the high dunes of the Dubai Desert also known as Sand Skiing..
Will we be picked up from the hotel when we book a Desert Safari? Yes. 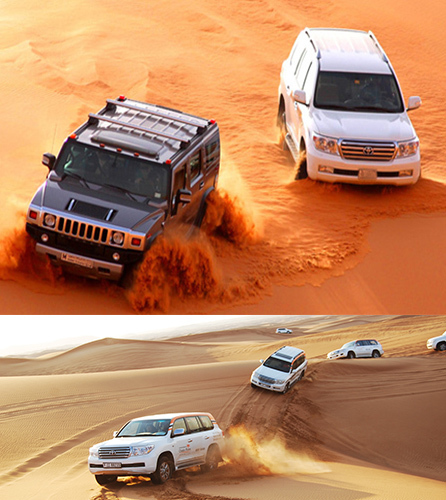 We provide you pick and drop off facility in Land Cruisers when you book a Desert Safari with us. What kind of clothes we should wear when on a Desert Safari? We don't have any particular restrictions on dressing when on a Desert Safari. As long as you are comfortable with the way you dress. It gets a little chilly at the Desert in the evenings, so we advise if you bring along something warm with you. How many people can maximum accompany us on the Desert Safari Tour? People in one Land Cruiser :6pax and in camps 300 to 500 numbers with star facility. What is included in the Desert Safari Dubai? The Evening Desert Safari includes, 2 way transfers from your advised location, 45 min of Dune ride in a 4x4, Camel Ride, Sheesha to smoke, unlimited Soft Drinks/Tea Coffee, BBq Dinner and a Belly Dance performance by a beautiful belly dancer. 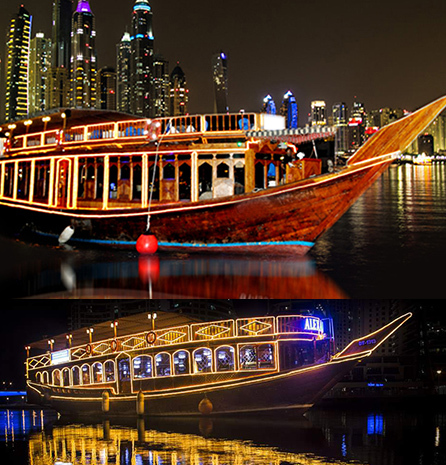 Dhow Cruise Dubai is your leisurely cruise on board our traditional Arabian Dhow. The excursion will begin from the historic Dubai creek on the aquamarine waters of the Arabian Sea. Enlightening entirely a diverse outlook of the amazing Dubai city, the merging of the past with the present, is as exciting as the city itself. While the cruise floats along the Dubai creek you will spot the old Dhows, Abras and luxury yachts, fabulous models of modern Dubai architecture like the National Bank of Dubai and Dubai Chamber of Commerce & Industry buildings, elucidated souks and palace whilst Sheikh Saeed's House, the place of birth of Sheikh Rashid (the father of modern Dubai) and the heritage village near Shindagha. The enchantment of the Dubai City, the cheery, calm atmosphere, real Dubai hospitality coupled with attentive service on board makes this tour a 'must do' while in Dubai. This memorable romantic cruise includes a delicious Continental Cuisine Buffet. Dinner is served with complimentary soft drinks and mineral water. The Dhow has qualified captains, crews and is fully equipped with navigation compass, fire extinguishers, First Aid Kit and life jackets. Incoming and outgoing tours witha selection of more than 3000 hotels, motels and service apartments worldwide. Winter Ski Holidays & Special Medical Spa packages in Europe. English & French Language Schools, Vaccation camps for children. Special interest Groups, Incentive Packages, (Business/Personal), Exhibition, Conferences handling etc. 24 hours backup services for international assistance. 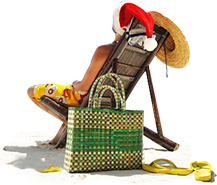 Special Promotions destinations-wise around the year. Copyright@ 7daysholidays. All Rights reserved.